A wood burning fire pit makes a great conversation spot on the patio. One of the great things about today’s outdoor living spaces is creating outdoor rooms without walls that block the view from one place to another in your Scottsdale, Phoenix, or Glendale landscaping. Today’s backyards continue to improve what it means to unwind and enjoy time with friends at home. This particular client now has a roomy patio and a fire pit ‘room’ just a few steps away, as you will see in the image at the bottom of this page. Why not just put the firepit on the patio? The need for this separation becomes pretty important when you want a wood burning fire pit, it keeps the smoke from taking over the main seating area. 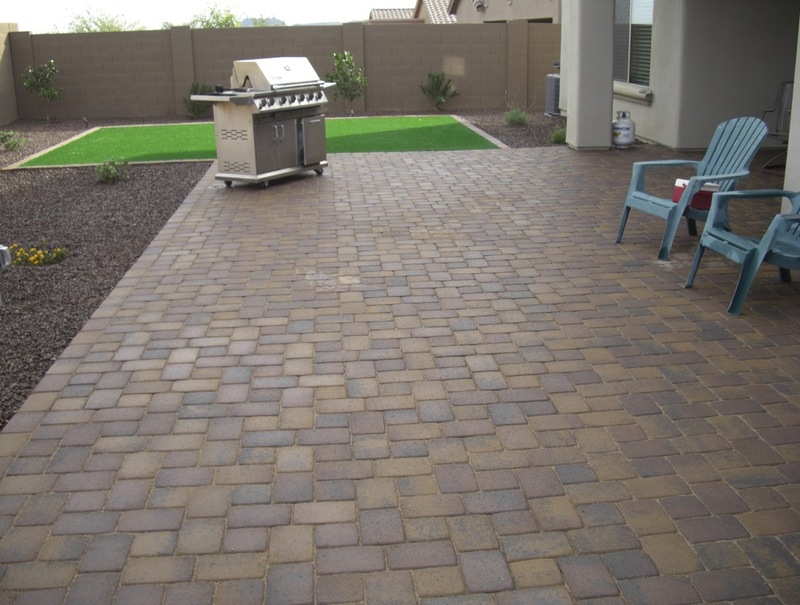 This patio is done with London Cobble pavers in Fossil Beige, which is richly colored without being too dark. 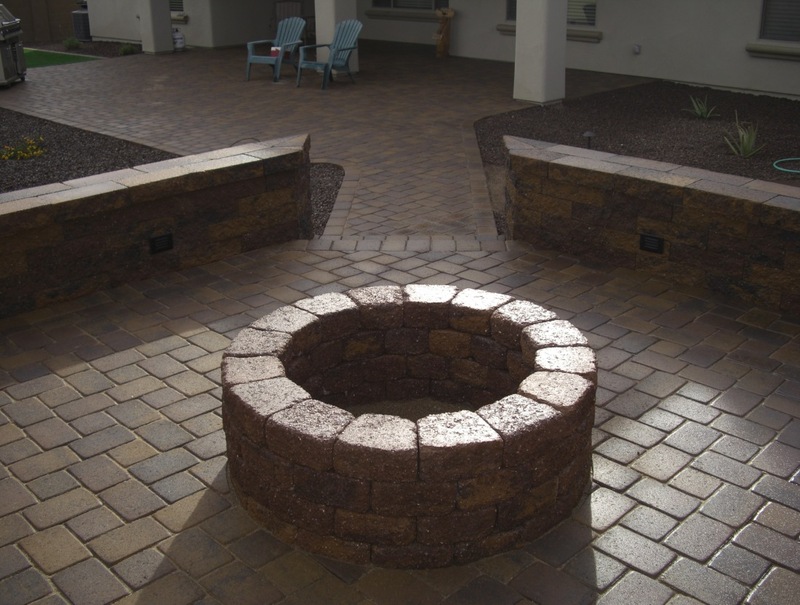 The fire pit itself is built from Versi Lok Tumbled wall stone in the same color, and the seatwalls that flank the fire pit room floor are also constructed from Versa Lock. The seatwalls have low voltage lighting built into them too – just what you need for getting the most of evenings around the firepits without path lamps or carrying lanterns around. These are all Belgard products you can count on to hold up to the elements and remain looking great for decades to come. Add fresh xeriscape plants, stone mulch, and an evergreen patch of synthetic grass, and you’ve got wonderful outdoor living spaces. Those well used Adirondack chairs are not the real patio furniture, the nice stuff moved in after the crew and their tools packed up and drove away when the work was completed.